Feb. 25, 1942: Searchlights converge on an unknown object in the skies over Los Angeles. During the early morning air-raid alert, more than 1,400 anti-aircraft shells are fired. The incident, now referred to as the Battle of L.A., occurred less than three months after the Pearl Harbor attack and two days after a Japanese submarine shelled an oil facility near Santa Barbara. The next day, on Feb. 26, The Times published a photo page with a retouched version of the above searchlight photo and seven other images of damage from falling anti-aircraft shells. This six-photo gallery includes two versions of the searchlight photo. The first was recently found at the Los Angeles Times Photographic Archive at UCLA by Simon Elliott, researcher in the Department of Special Collections at UCLA. The second version — retouched — was published in 1942. The second version exists as a copy negative also at UCLA. This week I inspected the negatives from which the two versions were scanned at UCLA. The second negative is a copy negative from a retouched print. Certain details, such as the white spots around the searchlights’ convergence, are exactly the same in both negatives. In the retouched version, many light beams were lightened and widened with white paint, while other beams were eliminated. In earlier years, it was common for newspapers to use artists to retouch images due to poor reproduction — basically 10 shades of gray if you were lucky. Thus my conclusion: the retouching was needed to reproduce the image. But man, I wish the retouching had been more faithful to the original. With our current standards, this image would not be published. The Los Angeles Times published another retouched version of the image on Oct. 29, 1945. 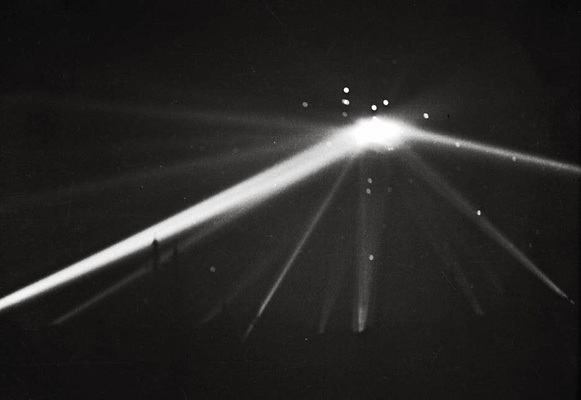 The white spots near the convergence of the searchlights are larger than in the 1942 version. This print is in The Times’ library and is in poor condition. Retouched searchlight version published on Feb. 26, 1942. Different retouched searchlight version published on Oct. 29, 1945. Larry Harnisch is posting additional Battle of L.A. information in the Daily Mirror blog. Also of interest is the March 9, 1942 Life magazine. On page 22 is another image of searchlights from the night of the Battle of L.A. In addition this Herald Examiner archive photo is st USC.